Love Cuts meet punk and twee in their newest EP. 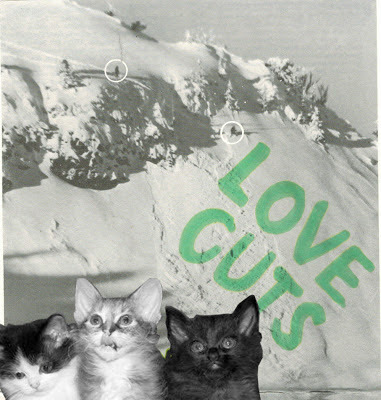 When I think of "Love Cuts" the first thing that comes to mind is the 80's track by The Flatmates. Love Cuts isn't just a song – they're a band, too. Three girls: Cheryl, Kaity, and Tracey based in Vancouver, Canada started making music and playing in DIY spaces a few years back. In the summer of 2011 the trio released a self-titled 7" via Nominal Records and have since uploaded shorter releases onto their bandcamp. Love Cuts' "+2 -1" is a fun listen of both love and anti-love songs. The vocals on this five song EP are punk-inspired and bold but juxtaposed with sweet, lighthearted lyrics. These girls give attitude without the anger – if Kathleen Hana went twee then it would probably sound something like this. And c'mon, can you really resist the kittens on the cover? First song "Extra" is carried through with punchy guitar riffs and lyrics as cute and cunning as Talulah Gosh. Despite most people's inclination to label any female-fronted punk band as being riot grrrl, Love Cuts is not necessarily trying to start a political revolution. "Call in the Dogs" is the only song on here that I would consider mildly close to being riot grrrl (ahem, Bratmobile-esque) and still it would be wrong to write it off as just that. The band's dedication to having fun and making music for music's sake is clear in love songs "Horoscopes" and "Solitaire" – both incorporate slow, jangly guitars and steady drumbeats. "Horoscopes" will especially sit well if you're an astrology freak (like myself) and a sucker for verses like "I will go to neptune / mercury and the moon / I wanna know if he's fine." However, fourth and favorite track "I Know" is different than the two love songs in its edgy energy. "I Know" (a song actually about not knowing) stuck out to me because it seemed to get catchier with each verse. It also made me feel good and yeah, that's pretty important too. Check out their bandcamp here.